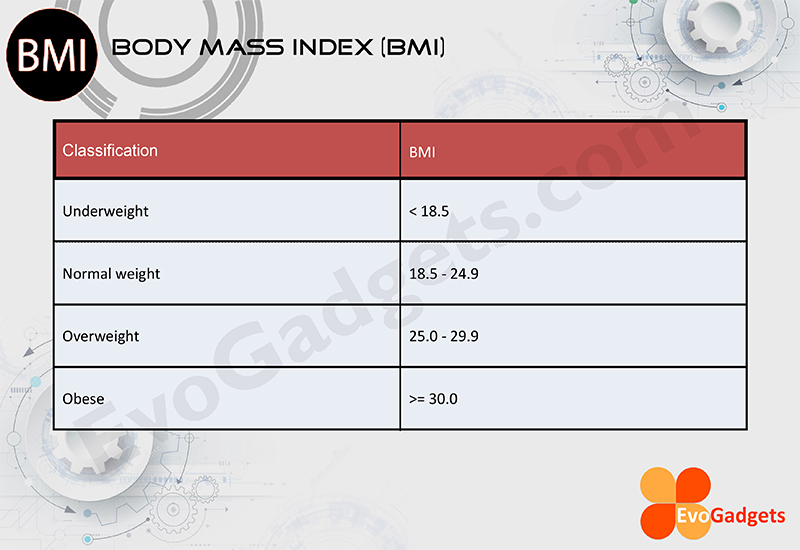 The Digital Body Fat Weight Scale is a compact, and highly useful health measurement and analysis tool to have around especially if you are required to keep in check with your body fat, weight, BMI (Body Mass Index), BMR (Basal Metabolic Rate - Calories burned) and other health information. 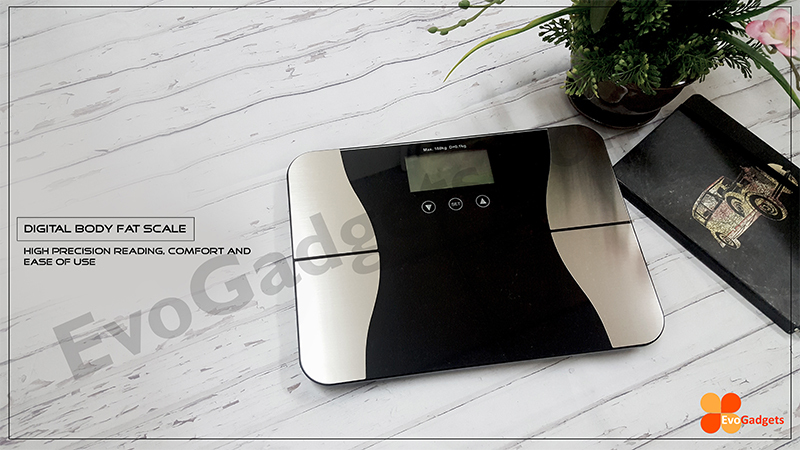 The Digital Body Fat Weight Scale is a fully digital scale which promises a high precision reading, comfort and ease of use. 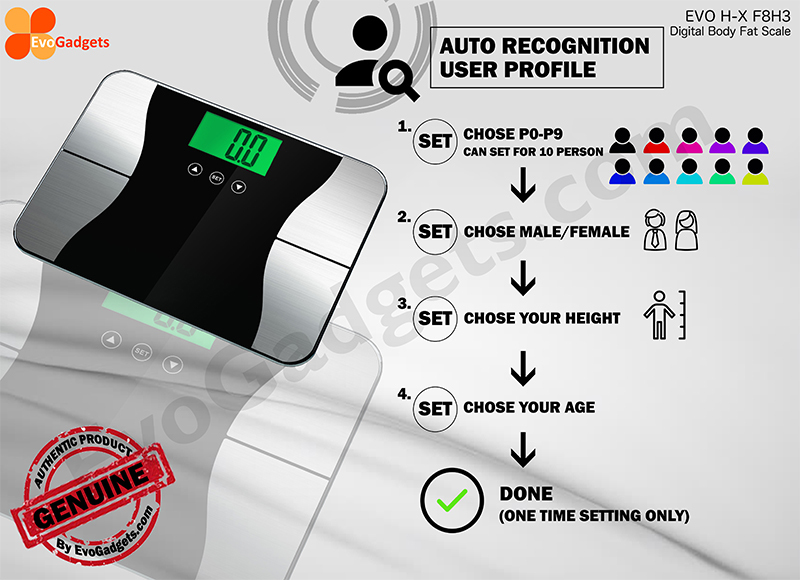 The Digital Body Fat Weight Scale comes equipped with precision technology to help you get a highly accurate readings on body fat percentage and weight. 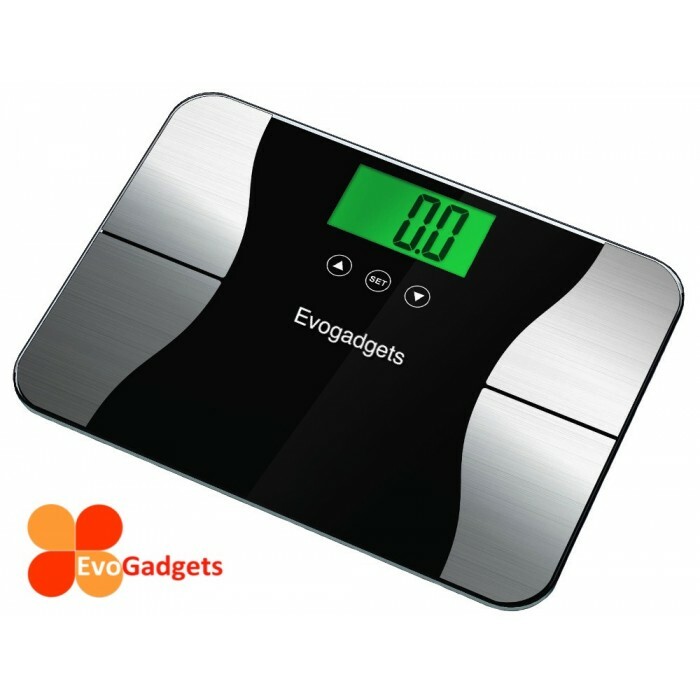 Plus, this scale comes with a large LCD display with green backlit which is clear to the eyes and easy-to-use minimalistic function keys. 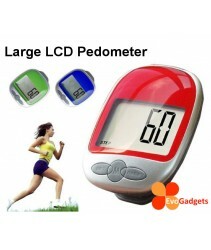 You can monitor your health effectively with this scale. 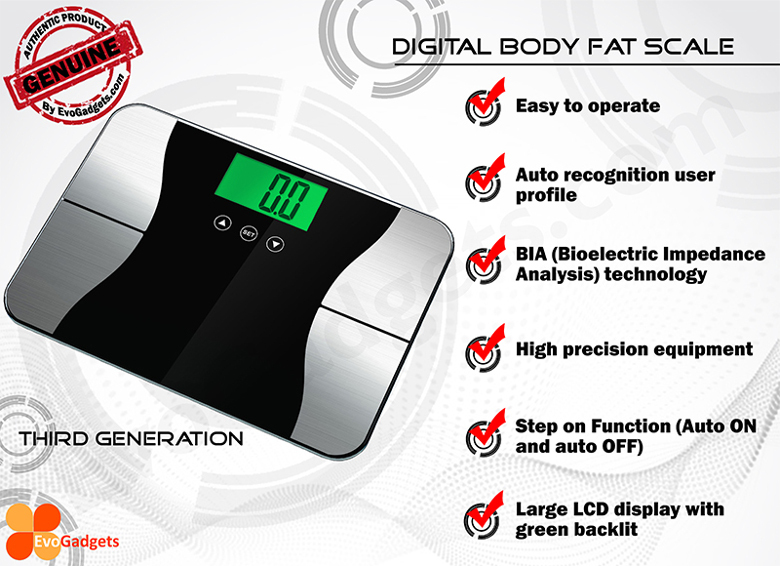 The Digital Body Fat Weight Scale is also a smart device which uses the uses BIA (Bioelectric Impedance Analysis) technology to determine your body fat. 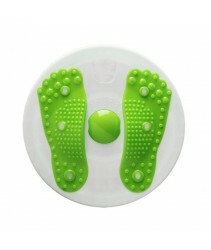 When you stand barefoot on metal foot plates, some weak electric will be collected as data and the Digital Body Fat Weight Scale will analyse the data together with your input to deliver high precision readings of your body composition analysis. 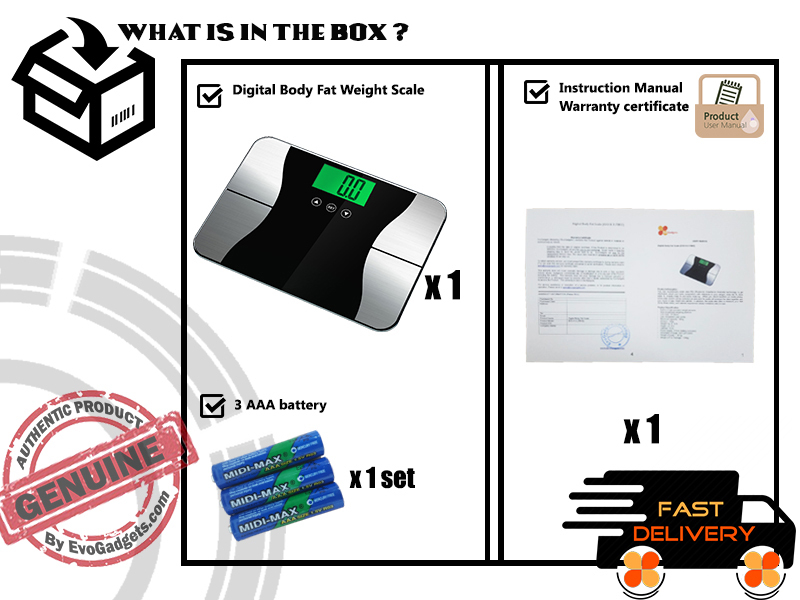 The information obtained from this scale is reliable, accurate and precise and will help you manage your health better and efficiently. 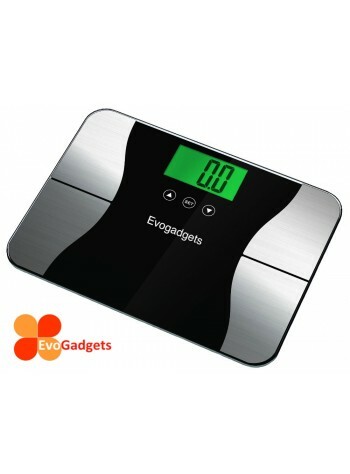 The majority of us determine the success of our weight loss by the number displayed on our bathroom scales. 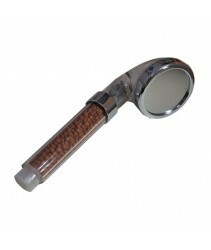 Unfortunately, weight alone cannot distinguish whether the weight comes from fat or muscle. 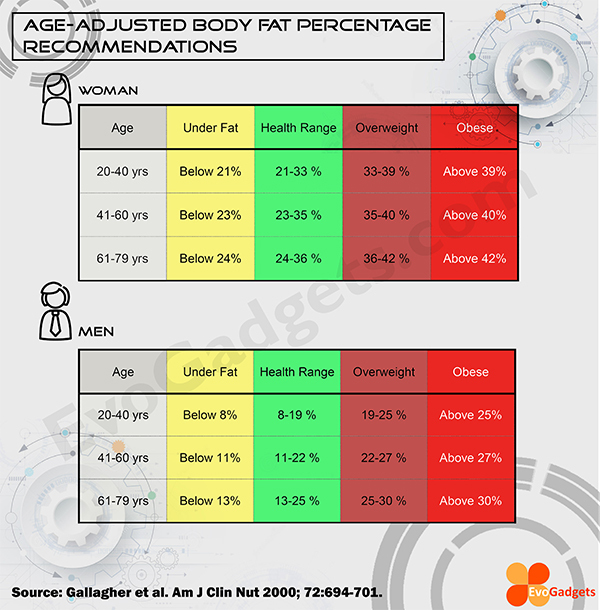 Knowing body fat is more helpful in weight control than just reading number on a scale. Think about it we all know someone who is skinny but out of shape, or someone who appears heavy but is actually fit. 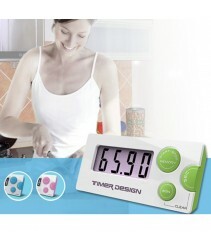 Just to put it simple, BMR is the amount of calories you'd burn if you stayed in bed all day. It does not include exercise, typing on the computer, walking, talking, sitting, or even thinking for that matter. Yet, your BMR is important because it account for 60%-70% of calories you burn each day. 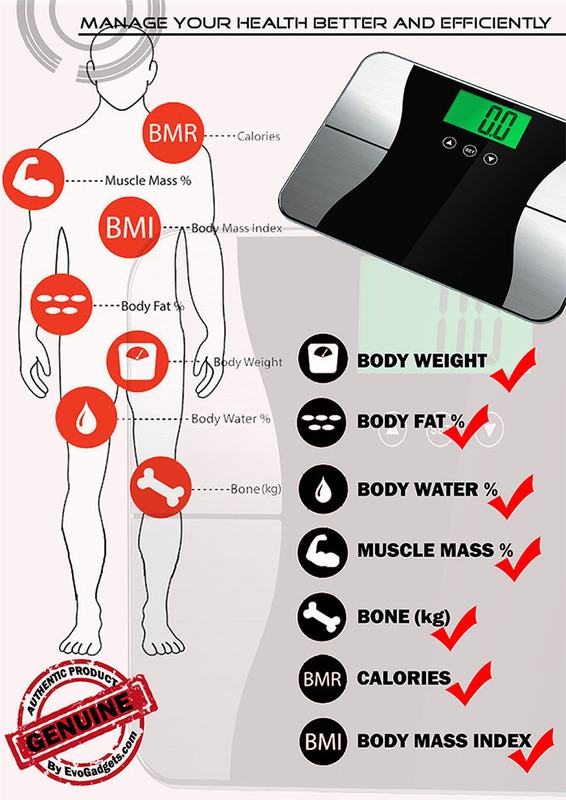 By knowing your BMR, you are able to create your weight loss plan more effectively. 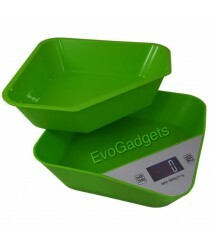 Don't put it on uneven floor while weighing. It will cause inaccuracy of the reading. 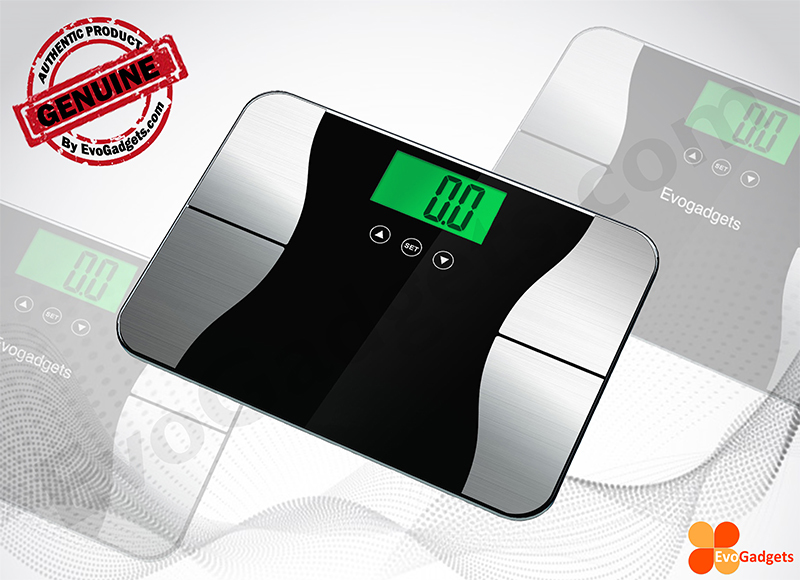 Don't step on the edge of the scale. 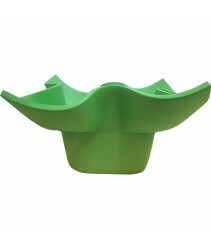 It might cause unbalancing and fall.